I've reviewed other Annabeth Albert books in the past and have squeed all over the place about how much I love her writing. Her books were my introduction to m/m romance and I quickly discovered my go-to trope, of which it seems Ms. Albert writes a lot (of the books I've read, all but one followed this theme). 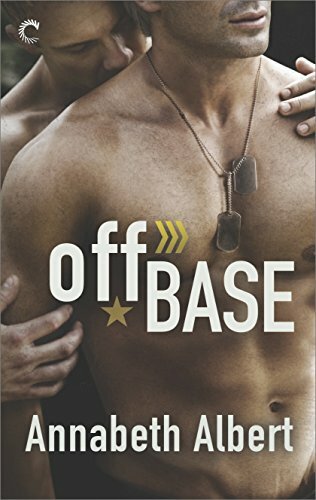 To be fair, I've only read her #Gaymers Series, so maybe her others have different themes, but Off Base is more of the same. Closeted man longs for love and a relationship, but doesn't think he is worthy of one. Then, he meets a guy who challenges all of his ideas about himself and decides that maybe he can have the type of relationship that he wants. Zack Nelson has always wanted to be a SEAL and he's finally about to see that dream become a reality as he's just passed an important test of his abilities. To celebrate, he and his friends are going to get together at a local bar. Unfortunately, he doesn't find out until he's already out that the only person able to come is the one person with whom he doesn't want to spend the entire night alone. Pike isn't even really his friend--he's only part of the circle because Zack's friend, Ryan, is dating Pike's friend, Josiah (the heroes of Connection Error). Pike is the total opposite of closeted and Zack is afraid what people will think of him if he's hanging out with him. Pike Reynolds can't figure Zack out; Zack swears that he's straight, but Pike isn't so sure about that. When something happens between them the night of Zack's celebration, Pike is even more confused, but also certain that he needs to stay away from the gorgeous SEAL. He's been hurt before and does not want to go down that road again. I LOVE, LOVE, LOVED this book. The chemistry between Zack and Pike was immediate and it was clear that these two were perfect for each other from the first page even if they weren't aware of it. What really pulled me into this story was the idea that even though Don't Ask Don't Tell has gone the way of the dinosaurs, there will always be homophobic assholes in the military. A big part of Zack's storyline is coming to terms with the fact that even though he is gay, he has every right to be a part of a SEAL team as his heterosexual counterparts--no matter what those counterparts may think. This was the catalyst for everything that happened in the book as the one teammate, who is aware of Zack's sexuality has made it uncomfortable (and possibly) dangerous for him to live on base, so Zack decides to find a place off base (hence the title) and makes a deal with one of the highers up to live in a house he and his wife bought rent free so long as he renovates the place on his own. Zack has never done anything so HGTV, but since he cannot afford to live off base in San Diego any other way, he accepts the offer. It doesn't take him long to realize that he is not cut out for the handy-man thing. Enter Pike. Pike needs a place to stay in San Diego and the only person in the entire city he knows is Zack. Neither of them are all that excited about living together, but neither see any other option, so with his cats in tow, Pike makes the move from Santa Monica to San Diego. The guys aren't very comfortable together, especially after the moment they had the night of Zack's party, but quickly become friends and eventually lovers. This change in relationship felt natural to both the characters and the story. I loved seeing Zack come to terms with his sexuality and understand that he's more than just who he finds attractive. The relationship with Pike made him more confident in himself and more willing to accept that he's never going to please everyone. The one issue I had with the book was its pacing. The first few chapters happen in June, then suddenly it is August, and finally it ends in October. I felt like we were skipping over parts of their lives that could have leant more weight to the climax where Zack confronts his homophobic teammate. I knew that was going to be a part of the narrative and Ms. Albert did a good job of making Zack's relationship with this particular person tense and whenever they were in a scene together, I found myself tapping my fingers against the arm of the couch (obviously a good thing), but I felt like this was somewhat underdeveloped as was the comparison to Zack's older brother, Danny, whom we never meet. Without giving away too many spoilers, Zack's fear of this other SEAL echoes the relationship that he had with his brother and colors everything Zack does when he is around the team, which is both stressful and at times dangerous. It is a rare thing for me to worry about the characters post-HEA--the only other time I remember that happening was in Indigo by Beverly Jenkins (because they were both operators on the Underground Railroad prior to the Civil War). I like my HEA's to last and I have a hard time buying that all of Zack's problems with the team ended with him coming out. People don't suddenly accept someone because they've confirmed their fears, something that was depicted very well earlier in the book when Zack came out to his parents, so the idea that removing the antagonist was going to make everything better surprised me. In the end, I did love this book even with the minor issues I had with it, and I am looking forward to the next book in the series, Out of Uniform, which comes out in April and that I've already received from Netgalley. I received a copy of this book for free through Netgalley in exchange for a fair and honest review.